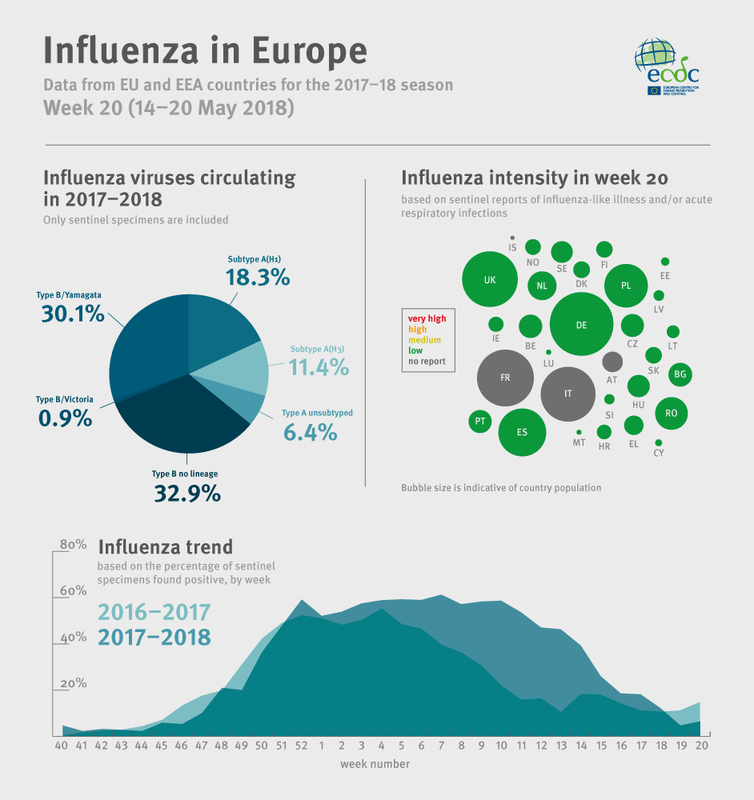 ECDC and WHO Europe monitors influenza activity in the WHO Europe region during the winter season and publishes weekly reports on the Flu News Europe website. This is the last weekly report of the influenza season 2017-18. During the summer, influenza reports will be provided on a monthly basis and published on 29 June, 3 August, 7 September and 5 October. The weekly reporting of influenza surveillance data will resume on 12 October 2018 for the 2018-19 season. Influenza activity has returned to inter-season levels in most countries in the Region. 3% of the individuals sampled from primary health care settings tested positive for influenza viruses (compared to 10% in the previous week). Aggregated regional data indicated that influenza viruses circulated at high levels between weeks 52/2017 and 12/2018 (based on increased proportions - 40% and above - of sentinel specimens testing positive for influenza viruses). This is longer than in recent seasons and may have contributed to the severity of this season. Different patterns of dominant influenza virus types and A subtypes were observed between the countries of the Region.